Breakaway Music Festival is going to be HUGE in 2017. This year we can experience double the fun in both Columbus and Grand Rapids, MI. Okeechobee opens the portal for 2017 with huge names! Euphoria Phase 2 is here and what a diverse selection it is! Headliner's include The disco Biscuits, Wiz Khalifa, and Zed's Dead. For some, music festivals are for more than just listening to music. Many seek self discovery, enlightenment and some even choose festivals as a venue to experience more significant life moments like marriage. Tying the knot at a festival is not an uncommon practice. Music festivals are already an ultimate experience. It's a place and time to be happy, away from addictive technology and day-to-day repetition. It's in those moments we discover the true beauty of those around us. Which makes it an ideal time to dedicate ourselves to the one we love most. For the first time, Euphoria Music festival will offer a number of different amenities for wedding ceremonies. Couples looking to make their engagement official have a unique experience to look forward to. Included in ceremonies, Euphoria partners specialize in intricate wedding cakes, elaborate reception and ceremony décor, skilled photographers, complimentary champagne toasts and much more. Getting married in a church isn't for everyone. What a better way to find your Euphoria than making your love for someone official. Anyone seeking an unforgettable ceremony can find more information at Euphoria's official website. It's that time of year again. Festivals are scrambling to get their plans for next year released before the holiday season goes into full swing. While hundreds of Electronic music festivals flood today's scene, the biggest and perhaps most well-known just made their mark. 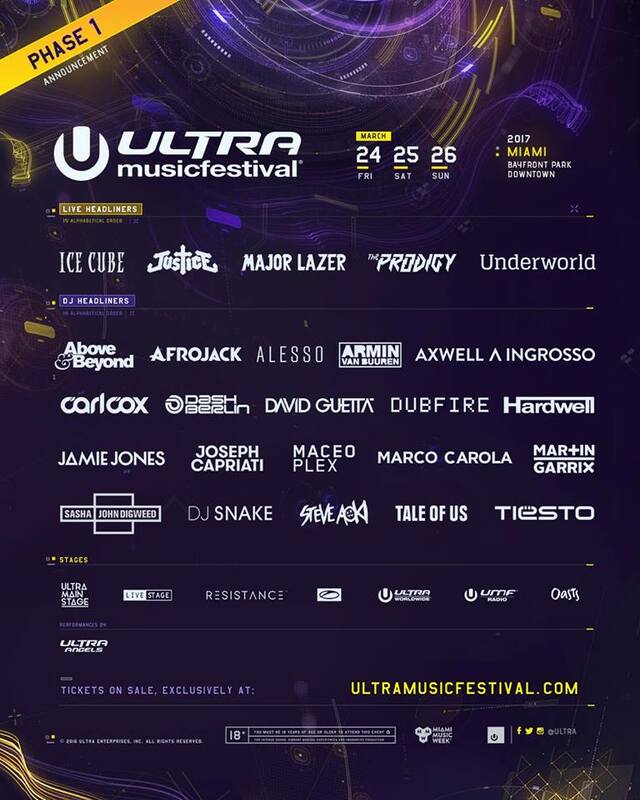 Ultra Music Festival held in downtown Miami disclosed their first phase of artists for next year with no warning! As usual, the selection is full of accomplished talent and features both live and DJ headliners. Some of the more notable bookings include Ice Cube, The prodigy, Sasha & Digweed, and Justice. If you needed a pick me up for your pre-weekend workday, this is definitely it! As it stands, all payment plans for Ultra 2017 are sold out. We encourage you to purchase your tickets ASAP!